Margaret Sale, trustee at The National Museum of Computing, has been honoured with a Point of Light award by No 10 Downing Street for ensuring that the contribution of the wartime work at Bletchley Park is not forgotten. The full announcement can be seen below. Margaret Sale, from Milton Keynes, is a driving force behind The National Museum of Computing at Bletchley Park. Having led efforts to save the site from demolition in 1992, Margaret and her late husband Tony then shaped the development of the National Museum of Computing. 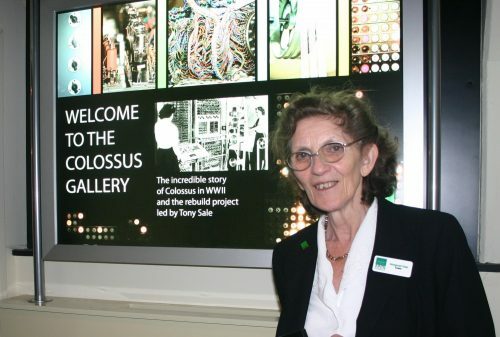 The museum now attracts 30,000 visitors every year and Margaret gives tours with a special focus on how Colossus, the world’s first programmable electronic computer, was rebuilt by her late husband. She is also the first-ever President of the Museum’s Members’ Club which, under her leadership, has become a thriving community of supporters who take part in regular events.